Is your supply chain designed to win with both Pure Play eCommerce Retailers and traditional Brick & Mortar Retailers in this fast emerging Omni-Channel world? The Tipping Point is Here! From 2014 to 2019, 50% of growth will come from eCommerce sales in the US CPG Market! Amazon continues to grow at an impressive pace and make inroads across CPG categories. The majority of your Brick & Mortar Retailers are actively piloting several Delivery & Pick-up Options for your consumers to understand which are most appealing to their shoppers and understand the impacts on their cost structures. Do You Have Answers to These Questions? What role does eCommerce play in your Go-to-Market Strategy? What are the new Supply Chain Requirements for CPG Suppliers? Will your Packaging survive new home delivery supply chains? What new Supply Network Capabilities are needed to compete and win? Is eCommerce built into your New Product Innovation Process? What is the Simpactful Difference? 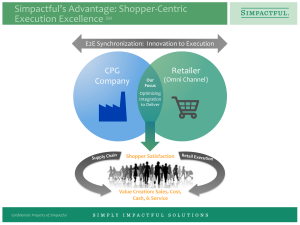 Simpactful thinks shopper back, acts from Innovation to Execution, and has recent hands-on CPG & Retailer experience. CPG Leaders from P&G, J&J, Kimberly Clark, & Unilever as well as Retailer Executives from Walmart, Target, and Safeway deliver unique merchandising, supply chain, retail operations, and eCommerce insights that are unparalleled. 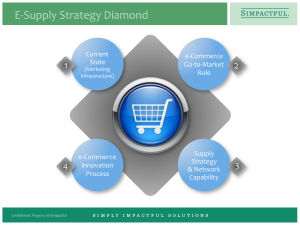 Simpactul’s eCommerce Team will utilize our E-Supply Strategy Diamond to help get your Supply Chain ready to win now and into the future in this fast paced Omni-Channel World. To learn more, contact us at https://simpactful.com/contact.aspx or call David Friedler at (925)-234-6394.